Grain is the foundation of modern industrial society. It is compact, has a long shelf life and is easily transported over long distances. It is produced by hundreds of thousands of individual farmers and consumed by billions. Yet between the farmers and those billions of consumers, an oligopoly of just four global grain-trading companies exists. This oligopoly was developed between the 1850s and the turn of the twentieth century and, with minor changes, that same oligopoly not only exists today but also has been extended to the food processing and retailing sectors. Canada’s western farmers confronted this oligopoly in the early 1900s by forming cooperatives and ultimately, in 1935, the Canadian Wheat Board (CWB) Act was passed. After a failed attempt at a voluntary board, the single desk was proclaimed in 1942. Farmers used the CWB to counter the exploitive market power exercised by this oligopoly with their own control over the sale and marketing of their product. Farmers had already succeeded in lobbying government to legislate the Canada Grain Act, which established the Canadian Grain Commission (formerly Board of Grain Commissioners) with a mandate to operate in the interests of producers. 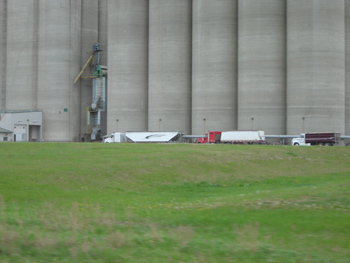 The Canada Grain Act established fair weights and grades, and the rights of producers to by-pass the line elevator companies by using producer rail cars to ship their product to millers and into export position. At export position, the CGC impartially weighs and grades grain into and out of the export terminal, and issues a “certificate final” which certifies the quality and quantity of the grain in the shipment. This is Canada’s stamp of excellence in the world grain market and is unique to Canada. The Canadian Wheat Board, and the Canada Grain Act are the lynch pins which allow Canadian farmers to export their grain around the world based on quality and reliability of supply. This highly specialized marketing helps western Canada’s farmers access premium price markets across the globe. In the past 30 years, wealthy and powerful business interests have pushed hard to eliminate government regulations and institutions that protected farmers. Many of the checks and balances imposed on the economy to stabilize it after the disastrous speculations of the late 1890s and the 1920s have been removed. Never before has there been more pressure to remove the farm community’s hard-won safeguards. 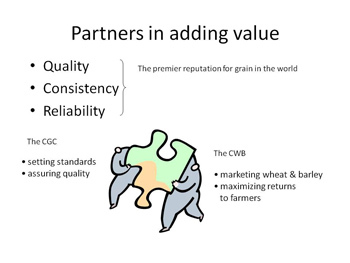 The Canadian Wheat Board Alliance seeks to preserve the values and benefits provided to our producers and communities by the efforts of our predecessors.